I promised I'd report back on the birthday dinner I made for my mother-in-law, and while I tried my very best, it wasn't as perfect as I'd hoped. The antipasto was great and the salad was superb (recipe next post), but I bombed on the Fettucine Alfredo. The sauce was the wonderfully cheesy, creamy artery-blocker I always make. The problem was the pasta. I boiled the water with salt, and dumped in the fettucine noodles in bunches, stirring each time. They had plenty of room to move around, as I used my biggest stock pot. I cooked them for the time specified on the box, stirring a couple of times throughout. But, when I drained the pasta (after pulling a noodle out and checking it, finding it done correctly) I noticed that there were nasty clumps of glue-together strands. Of course, I dumped these out because I would never serve them. I proceeded to plate the rest and spoon the sauce over the top, finishing the dish with sauteed portabella mushrooms and a sprinkle of tarragon. The MIL and the 13 year old child happily dug in, but I noticed something was amiss when I looked at the Husband across the table. The expression of disappointment on his face was heartbreaking. He had been so excited about one of his favorite dishes, and he wasn't happy. I asked what was wrong, and he told me to have a taste. I did and discovered that the noodles were gummy and cooked unevenly, rendering the dish pedestrian at best. Not my proudest moment. I thought back to what could have possibly gone wrong. The sauce is an old family recipe, and I followed procedure to the letter. It was great. But the fettucine noodles themselves? Horrible! What was different this time? Salty water? Check. Lots of boiling room? Check. Lid half on/half off? Check. Tasting the noodles before draining? Check. The only variable that was different from other times was the brand of pasta I used. My go-to-brand is DeCecco, but I was in a hurry and Safeway didn't carry it, so I bought Barilla. So, this should serve as a lesson: Never try a new brand when you're out to impress your dinner guests! If I had been making this on a random Tuesday, it wouldn't have been a big deal. Live and learn, I guess. Then blog it so others won't make the same mistake! A messy fridge can sneak up on even the most vigilant cook. And, it results in mayhem. I believe the ease in preparing dinner is directly proportionate to the organization of one's refrigerator. Don't get me wrong; I'm not going to get all Bree Van de Kamp on you and insist that cheese should be arranged according to pungency. BUT... having things placed in 'quadrants' has certainly helped me really see what I have, how it relates to other foods, and not forget to use it before it goes bad. It starts out fine on the top shelf, which is for beverage only, ranging from healthy to not, left to right. The trouble begins just below the cheese/lunchmeat drawer, where I've stuffed random items such as artichoke pesto and bags of fruit salad. This area should be only for lunch items, like bread, leftovers, etc. To the right of the wayward salad, we have a tupperware full of bacon grease (that one needs its own post), a bag of Mexican cheese (should be in the drawer) and leftover pasta. The bottom shelf is where the food has seemingly staged a rebellion, with veggies that have escaped from their drawers, and a tub of hastily stashed whipped cream, which should be in the freezer. There might also be a steak or two in the very back, but because I can't see it, I could be presented with an exercise in spontaneous generation before I get to it. My advice? Divide the refrigerator into quadrants, or sections. Beverages, lunch items, veggies, side dish stuff, meats. This way, when searching for inspiration, you can concentrate on one area at a time, cutting down on the amount of 'refrigerating the entire neighborhood' by holding the door open. So, I had a messy fridge. What's my point? 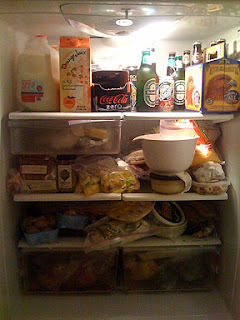 When it was like this, I couldn't figure out what to cook because I had no idea what I had, what was still good, what needed to be used up, etc. It's since been organized, and now I have some room in my head to dream up tasty dishes instead of trying to figure up what's going on in the dark corners of the crisper.